New Day heads to the ring. Woods and Kingston are dressed in suits, and Big E is dressed as a new year’s baby. Woods welcomes everyone to 2019 and announces that all three members of New Day will participate in the Royal Rumble match. Big E tries to do some Steiner match while talking about their chances to win the Rumble. Kofi says that the match says that New Day has a better chance of winning than everyone else, and they are looking forward to their Wrestlemania title shot. Kofi goes off talking about how the current Universal champ doesn’t want to show up for work, but Woods and E calm him down. Before the Rumble though, New Day has some new year’s resolutions. Sadly, Woods says that their doctor has told them that they need to resolve to not eat pancakes anymore. While Woods speaks, E eats pancakes that he pulls from his diaper. Kofi resolves to buy a new yellow Volkswagen that is more than meets the eye. Woods resolves to learn how to lead his children to safety while blindfolded. Big E then gets very worked up while talking about the tonight’s show. He can’t seem to remember who will be facing Samoa Joe in the first match of the night though. Who is it? It’s Jeff Hardy. Good match. The end got a little weird when the referee restarted the count for no good reason when Joe was trying to get Jeff counted out, but other than that, this was fine. Joe definitely looked like the stronger competitor tonight. A lot of the anger Jeff previously had seemed to be gone. AJ Styles walks into Vince and Shane McMahon’s office. Styles does not apologize for hitting Vince last week. Shane gets a bit upset, but Vince holds him back. Styles leaves, and Vince smiles. Shane tells Vince to be careful with what he’s doing to Styles. In the ring, Kayla Braxton introduces Rusev. Rusev and Lana head to the ring. Braxton asks Rusev how his US Title reign will differ from Nakamura’s. Rusev says he takes the US Title seriously, and he will defend the title against everyone with strength and honor. His word is his pledge, and Rusev pledges his allegiance to the US Title. As Rusev speaks, Shinsuke Nakamura attacks Rusev from behind. Nakamura stomps Rusev in the corner, and Lana jumps on Nakamura’s back. Rusev kicks Nakamura, but that causes Lana to fall (sort of) underneath Nakamura. As Rusev checks on Lana, Nakamura delivers a Kinshasa to Rusev. Nakamura takes the US Title and drops it onto Rusev before leaving the ring. This wasn’t much of a match. There was a bait and switch where Mandy Rose was announced, but Sonya Deville ended up being the person to face Naomi. Then the match had barely begun when Rose got on the mic for a big distraction. And then we saw Deville’s new finisher where she basically gives herself a giant DDT. This was all about story (Rose going talking about Jimmy Uso), but I’m not so sure that I like the story very much. Randy Orton is looking past tonight’s fatal five way and onto winning the WWE Title at Royal Rumble. Rey Mysterio didn’t come back to WWE for nostalgia, he came back to be WWE champ. Mustafa Ali wants to be the heart of SmackDown Live. The IIconics resolve to become the first ever women’s tag champs. Anderson and Gallows resolve to eradicate SmackDown Live of all the nerds. Shelton Benjamin thinks new year’s resolutions are a fraud, so he rips down the new year set behind him. Samoa Joe plans to push Jeff Hardy deeper into madness and jealousy when he wins the WWE Title at Royal Rumble. John Cena heads to the ring. Cena’s here, but why? He doesn’t have a reason yet, but in about 30 seconds, someone is going to come out and tell him he’s old, his hair is dumb, and he should go back to Hollywood. Cena waits for someone to come out. Becky Lynch heads to the ring. Lynch says that she wasn’t just attempting to replace Charlotte on WWE posters in 2018, she was also aiming to replace Cena. Cena’s time is over, and there’s just one person who can take his place. That person is The Man, Becky Lynch. And if Cena doesn’t agree, Nikki Bella won’t be the only woman to drop Cena this year. Andrade Almas and Zelina Vega come out to the stage. Vega says Lynch and Cena, as former champs, are old news. WWE’s fresh start is about new faces. Cena’s face is old, and Lynch’s face is broken. 2019 will be the year of tranquilo. John Cena tells Vega to come down to the ring and back up her words in a mixed tag match. Almas and Vega are up for it. Good match. Lynch and Vega bookended the match, and the middle was mostly Almas beating up Cena. This was fun, and the final couple of minutes were very entertaining. The pace picked up considerably when Lynch got the late tag, and Lynch dominated. She even threw Cena out of the ring at one point. The Miz thanks Shane McMahon for giving their team a chance. Shane says he has a lot of responsibilities, but he is a man of his word. Hearing that, Miz suggests some matching wardrobe for their team. Shane isn’t into it. Some NXT superstars are still headed to the main roster. Triple H asks Asuka who she thinks deserves a title shot. Asuka says she’ll fight anyone. Charlotte appears and says that she’d be champ if not for Ronda Rousey. Carmella appears and says she beat Charlotte and Asuka twice each. 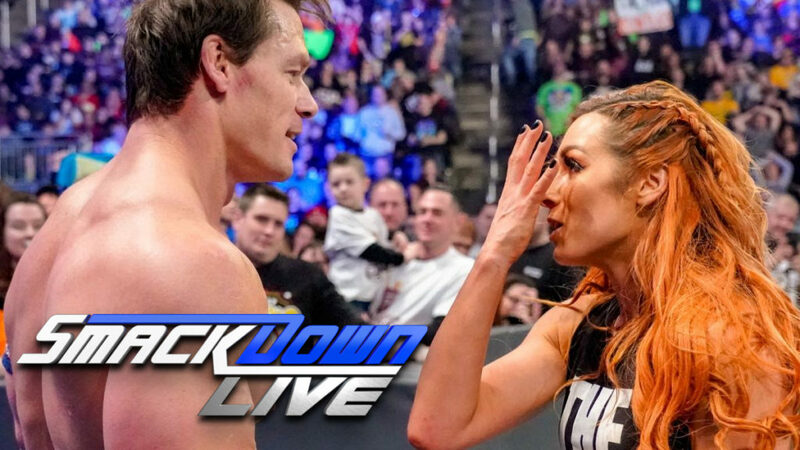 Becky Lynch appears and says the only person who deserves a title shot is The Man. Triple H will take all of this under advisement. Very good match. There were multiple matchups throughout the match, and they were all great. Everyone had their moments when they looked great, and that was very nice to see. A couple of my favorite moments were when Orton and Joe took out Styles at ringside, when Ali and Mysterio faced off one on one in the center of the ring, and the finish. This was lots of fun and very satisfying. This was a very good show. Other than the Mandy Rose/Naomi stuff (which I’m only sort of into), I liked everything on this show. The Cena/Lynch segment and the main event were my favorites, but there were a lot of very close segments just below those. This was a super fun main event.